The following is the first of a series of excerpts from The Rowan Tree: A Novel by Robert W. Fuller. The complete novel is available for Kindle and for other ebook formats. A print edition can also be ordered from Amazon. The sound of her voice brought him to his feet. Even after all these years, he knew the invocation by heart: “ … in the name of Jefferson College, and by virtue of the powers vested in me, I confer this degree upon you with all the rights and privileges thereunto appertaining.” Easter unfurled the silk-lined velvet hood, raised it over his head, and placed it around his neck. I do hope you will accept this overdue honor. I look forward to seeing you after all these years. Please drop by the President’s House after the ceremony, say around nine. He let himself into their Upper West Side apartment and listened for Sara. 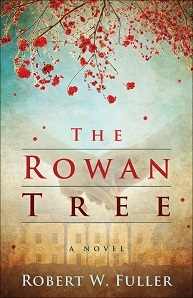 Though no sounds or sights revealed her presence, after five years of married life, Rowan could sense when she was home. As he hung his coat in the hall closet, her muffled voice reached him from the kitchen. He took his usual spot on the sofa and scanned the room. Orange crates still held their college books, but a Tiffany lamp that Sara had bought to celebrate his move to the dean’s office at Columbia hung over a worn easy chair. He took off his shoes and inched his feet across the coffee table, nudging aside a stack of Sara’s professional journals to accommodate his long legs. “Champagne, Mr. President,” Sara intoned as she entered the room bearing a tray with two crystal flutes. She was wearing a lime green miniskirt and a T-shirt. She still looked more like the student he’d fallen in love with six years earlier than the chemistry professor she’d become. She handed him the bottle. “Until the butler arrives, you’ll have to do cork service,” she said, ignoring his question. As he removed the cork she plopped down at her end of the sofa. Their champagne fizzing, they swiveled to face each other. Just as their feet were about to meet in the middle, Sara jumped up and ran to the kitchen. “Oh, thank god I haven’t burned the pizza,” he heard. She returned with two plates, each holding half of what twenty minutes earlier had been a frozen pepperoni pie. In one flowing movement she settled back into her spot and handed Rowan his half. Until her late teens, she had devoted herself to ballet with the same single-minded passion she now brought to chemistry. But by the time she’d left high school it was clear that her knees would not withstand a dance career. As always, his touch calmed her, but after a few minutes she tucked the foot he’d been rubbing under her free leg, and he slipped his empty hand between the cushions. “Wow! Bring the cook along when you come.” Sara hated cooking. She always said that chemistry had all the recipes she could stand in her life. “Is it really a mansion?” she asked him. “You’ll see,” Rowan said, wondering if the stately, ivy-covered Georgian manor would prove a drawing card. “I can’t wait to see it.” Rowan refilled their glasses, and when they’d drained the bottle he reached for her, and she yielded to his pull. Rowan invariably woke up first. When he rose from the rumpled bed the next morning, he glanced down at Sara, still asleep, her long auburn hair spread across the pillow. Wide-set eyes, full cheeks, and a petite nose combined to give her face a pleasing symmetry. But what held his gaze was her earnest look. Even when she was asleep, she always seemed full of purpose. Indeed, what had first caught his eye was the determined way she strode across the Columbia campus. Spotting her at the chemistry building one morning, he contrived to run into her that afternoon at the department’s daily tea. Only after they’d begun dating, and she’d told him about her dancing days, did he connect the elegant way she carried herself with her ballet training. Losing her childhood dream had strengthened her resolve to succeed at science, and she’d clawed her way to the top of a field ruled by men. He was proud of her. Rowan set out a multivitamin and a glass of orange juice for Sara and was wondering whether toasting the last of the bagels would freshen it when the phone rang. It was Wilfred Knight, the kinetic chairman of Jefferson’s Board of Trustees, calling from his command post in a mid-Manhattan skyscraper. “Good,” Rowan said, relieved to be done with the formalities. The call had roused Sara. As she padded down the hall he took the bagel out of the toaster, quickly spread it with cream cheese, and served it to her as she sat down. Looking skeptical, she washed down the vitamin with a sip of orange juice, stared at the bagel, shifted around in her chair, and looked up at Rowan. Sara had always dreaded turning into her mother, who’d given up a career in biology to raise a family. If Rowan ever wavered in his support for her career, a holiday dinner with her family was all it took to remind him how the bitterness of unrealized ambition can poison a marriage. Rowan loved engaging with people one-on-one, but chitchat made him uncomfortable. At cocktail parties he’d feel that while one part of him made small talk another part was watching from a distance, judging him a phony. A few days later, cramped into an economy seat, Rowan flew to Jefferson for his début as president-elect. Columbia students had already resorted to force in pressing their demands for a say in University affairs. Jefferson’s students had not yet turned their fury on the College itself; his honeymoon at Jefferson could be brief. Old President Jacoby and his wife had tried to appease Jefferson’s students by offering them refreshments in the President’s House. When he had refused to address their demands, they had stormed out. The next day the college paper had run an editorial calling for the president’s resignation. Mystified and hurt, Jacoby had called Chairman Knight for moral support. But when Knight had asked him how he planned to respond to student complaints, Jacoby’s only idea was to hold a teach-in on civility. As the head of a global foundation, Knight had his finger on the national pulse; this was not the first time Jacoby had turned a tin ear to calls for change, and Knight had had enough. He had little trouble persuading his fellow trustees to offer Jacoby a nice retirement package and seek new leadership for the College. Rowan had learned these details from Knight himself at a lunch in his private dining room at foundation headquarters. Over dessert, Knight asked him the same question he’d asked Jacoby: How would you address student grievances? Rowan had said they could no longer be treated like kids. They were young adults, and colleges had to recognize it. What’s more, when it came to civil rights and women’s rights and student rights, the young were on the side of history. It was their elders—professors, administrators, and trustees—who had to change. He knew that Jefferson was looking for a new president but he wasn’t concerned about offending Knight; if the board saw the job as mollifying students, he didn’t want it. Rowan’s answer evidently had met with Knight’s approval because, within the week, he’d been invited to campus to meet with the presidential search committee. He was aware that in normal times his stint as a dean at Columbia wouldn’t have qualified him for a college presidency. Presiding over a campus was a job traditionally given to seasoned older men. But these were not normal times—campuses everywhere were erupting. During his search committee interview, one thing had come up again and again: While he was teaching physics at Columbia, Rowan had also taught science in a predominately black Harlem high school. Jefferson’s white liberals couldn’t get enough of it. They seemed to want to believe that, when it came to race, he was a step ahead of them. For two full days, trustees, administrators, professors, and students had grilled him, not only on race, but on all the hot-button issues of the time: the status of women, dormitory life, educational policy, and governance. At the final committee interview, the chairman led off. “You’ll get no objections from the board,” Knight interjected. Rowan knew that in Knight, he had a formidable ally, but he also knew that many key reforms would require the approval of the faculty. “But will I get your active support?” Rowan looked directly at the student and faculty delegations. “Reform is not easy and it’s not cheap. For example, achieving ethnic diversity at Jefferson will require more counseling and tutoring and more scholarship money, and that means changing our priorities.” Several students nodded. The inquisition was over; it was now a courtship. Even before Rowan had left campus, Knight told him that he had conducted a straw poll, and the job was his if he wanted it. As a dean at Columbia, it had riled him to watch his superiors try to placate students who wanted reforms with nothing but cosmetic fixes. Jefferson seemed eager for fundamental change, and he’d promised himself that if he ever got the chance, he’d take no half-measures. Now, to his astonishment, that chance was his. His doubts about the job dissolved—he wanted it. He phoned Sara to tell her the news. She said she was happy for him. For an instant, he wished she were happy for them, but he had long since accepted the reality that he had his passions, and Sara had hers. “Hello, President Ellway. I’m Easter Blue,” she said, offering her hand. “I appreciate the welcoming party,” he said, wondering if her Afro was soft or scratchy to the touch. “Congratulations on your appointment,” Robin said, drawing up to his side. She had red hair and freckles and, like Easter, wore an ankle-length skirt. But there the similarity ended. Easter’s skirt was a sophisticated African print that emphasized a voluptuous figure; Robin’s was a tie-dyed souvenir of the Summer of Love and gave no hint of curves beneath it. “You still look like your yearbook photo,” Robin gushed. “Not everything, thankfully,” Victor said, his formal manner echoing his tie and jacket. “Absolutely,” Victor replied with unmistakable pride. Rowan looked sideways at Robin and caught her sarcastic grin. En route to the inn, Easter steered the conversation deftly as she navigated the country roads. At Jefferson’s town limits, Rowan became aware of his mounting anticipation. He’d taken this road into Jefferson scores of times as a student, and now he was returning to campus as president-elect. Suddenly, wailing sirens interrupted his reverie. Police cars were racing toward a swarm of people in front of the administration building on the far side of Jefferson Square. Easter parked the car at the inn, and Robin and Victor hopped out. “What’s going on?” Robin called to a passing cyclist. “I heard this might happen,” Robin said. “I don’t know about you guys, but my place is over there.” Without so much as a backward glance, she raced off toward the campus. “Robin!” Easter called after her. Exasperated, she turned to Rowan and apologized, trying to be a dutiful hostess. Rowan, peering through the trees, could just make out the lettering on a huge banner: JEFFERSON FOR PEACE AND JUSTICE, as the sounds of the crowd rose and fell like a howling storm, punctuated by honking horns. His mind was racing; joining a student antiwar protest was no way to make his first appearance, but retreating to the inn wouldn’t do either. He had to free himself of his student hosts. Victor left Rowan’s suitcase in the care of a bellhop and took off. Rowan noticed that he headed away from the fracas. The bellhop, recognizing that in Rowan he had a captive audience, seized the opportunity to denounce the demonstrators. Rowan nodded ambiguously and picked up his bag, insisting that he carry it to his room himself. After he changed into a clean shirt, he set out across the square to discover his new life. Halfway across the green, he mounted the steps of a gazebo for a better view of the demonstration. From his perch he could see dozens of students violently rocking a vehicle bearing an Army insignia. More students locked arms in a larger circle to block the advance of helmeted police brandishing truncheons. Numbering only a dozen, and facing an incensed mob, the police seemed to think better of assaulting them, and retreated. Minutes later he heard tear gas canisters detonating, and saw clouds of smoke waft over the crowd. From his experience at Columbia, he knew to keep his distance. Before long, the uniformed recruiters abandoned their surrounded vehicle and staggered into the protective embrace of the police. Wandering incognito around the periphery of the battlefield, Rowan could see paramedics in gas masks giving oxygen to students overcome by fumes. He heard the mournful sound of sirens in the distance as he made his way back across Jefferson Square to sanctuary in the inn. Good god, he thought, what have I gotten myself into? Precisely at six that evening, the phone rang. As he stepped off the elevator a half-dozen students leaped to their feet. He went around the circle shaking hands while, at his side, Easter introduced each one. The group walked across the town square, and into the cafeteria where the smell of greasy food displaced the lingering traces of tear gas. His little posse accompanied him to a large table where students were boisterously rehashing the day. Easter hushed them and introduced Rowan. Robin led off by asking what he thought of the demonstration. All eyes fell on the president-elect. There was a burst of applause from all over the cafeteria. Turning to face the gathering crowd, he said, “I’ll elaborate on my views tomorrow at the open forum, but tonight, I’d like to hear what you think.” His invitation unleashed a torrent. One after another, students held forth, on co-ed dorms, racial diversity, the draft, town-gown relations, inflexible requirements, and on having no say in College governance. They were so grateful to be heard that there were no more questions. Rowan would have been there all night if, just before midnight, Easter hadn’t climbed up on a chair, waved her hands for quiet, and called out, “Aren’t we going to let President Ellway get some sleep? He has a full day tomorrow.” Rowan took the opportunity to offer her a supporting hand as she stepped down. Instead of immediately letting go she gave it a tug, and headed for the exit, clearing a path through the throng for the two of them. “Exactly,” she replied, extending her hand. He reached out and shook it. “My pleasure,” she replied, and turned to cross the dark square. As he watched her form recede, he imagined her as an ally in the battles to come, and he couldn’t picture her being on the losing side. Rowan awoke to a gray, soggy day and found that the battery in his shaver was dead. Normally, he tried to do something else while he mindlessly ran the Norelco over his face, but with a spare razor he had to monitor the task. He was not one for mirror gazing. He’d weigh himself occasionally, but apart from that, he was indifferent to his appearance. Asked to describe himself, he’d have been hard put to say more than that he had a long face, blue eyes, and light-brown hair that refused to lie flat on one side of his part. He’d recognize himself in photos, but less from his facial image than from remembering the occasion on which the photos had been taken. Distracted, he nicked his chin. He rinsed off the reddening suds, dressed quickly, and took the elevator down, blotting his cut with his handkerchief one last time before stepping out into the lobby. Four professors rose as one to welcome him. The group spokesman was Donald Bentley, chairman of the chemistry department and, of particular interest to Rowan, an ex-boyfriend of Sara’s from her undergraduate days at MIT. Rowan was pleased to see that Bentley had developed a paunch in the years since college. Bentley led the way to a private room in the inn, decorated with floral wallpaper from the forties. A lone potted fig tree stood dying in one corner. Set out on a side table was the same fare—watery orange juice, lukewarm coffee, and greasy eggs—that Rowan remembered from the visit he’d made for his interview. Rowan resisted an urge to say what he thought of this question. How could a faculty leader go straight to the issue of compensation in turbulent times like these? To hide his annoyance, he put his arms on the table and made himself lean forward, all ears. Bentley was just warming up. That triggered a heated discussion of the merits and demerits of several innovative grant proposals the College had in the works. Without taking sides, Rowan let Bentley know that they were the kind of projects he would go to bat for. Rowan wondered what Sara had ever seen in this prig. If Bentley were actually speaking for the faculty, then winning its approval for his plans was going to be much harder than he’d imagined. The benefactor of the new library, George Clay, had insisted on giving the president-elect a guided tour of the half-finished building that would bear his name. With Mrs. Clay trailing behind her husband like an obedient dog, Mr. Clay showed Rowan through every room in the monument he was erecting to himself. From the sundeck on its roof, they had a panoramic view of Jefferson’s tidy campus. The clouds had lifted and vapor rose from the groomed athletic fields that lay beyond the nearly completed “Mike” Marlborough Men’s Gymnasium, named for the trustee who had provided the funds. Presiding at its dedication would be one of Rowan’s first ceremonial tasks as president. When he asked if a tour of the building was on his schedule, he was told that Mr. Marlborough had insisted on showing the president-elect through the gym himself, and was making a special trip in from Detroit the following day to do so. At the center of campus stood a cluster of limestone buildings overgrown with ivy, all dating from the early twentieth century. These included Seeger Chapel, the College Archives, the Administration Building, which held his future office, and a classroom building topped with a patina-covered copper-domed astronomical observatory. Students moved like columns of ants along sidewalks linking the buildings. Rowan recalled the sting of the winter air on his face during his student years as he’d biked along these paths to early morning classes. Some of Rowan’s happiest hours had been spent in Walker, so Clay’s threat to his dear old gym felt like a blow. By the time he freed himself from the dutiful rigors of smiling at Mr. and Mrs. Clay, his face ached. Jefferson’s Black Caucus invites you to a barbecue tonight at six o’clock at Sojourner Truth House. The note smelled faintly of perfume. It was signed “Easter.” Below her signature was a postscript. P.S. See you at the forum this afternoon. Good luck. Their good faith touched him, and he promised himself not to fail them. Most of the student body was there, come to see the man chosen to replace the one they’d hounded from office. Half a dozen placards poked out of the crowd: ABOLISH DORM VISITING HOURS; US OUT OF VIETNAM; BLACK IS BEAUTIFUL. NO MILITARY AT JEFFERSON was held aloft by a white student wearing a Lenin cap. The banner proclaiming JEFFERSON FOR PEACE AND JUSTICE, tattered and mud-splattered from the previous day’s fracas, was draped along one wall. There were microphones in the aisles, and students were lining up behind them. Rowan detached the mike from the lectern, walked to center stage, and stood gazing out at the upturned faces. He felt like a gladiator entering the Colosseum. With exams behind them, their final protest registered, and graduation imminent, the students were in a festive mood. After pondering the question for as long as he dared, Rowan deadpanned, No. “Same answer.” The laughter grew friendlier. Rowan was not going to duck this one. “We’re at a crossroads,” he began, “not just our college, but our country as well. There are several areas where the past can no longer serve as a guide to our future. As a College and as a country we’re rethinking the relationship between the races, between the sexes, and between elders and the young. “I think our College’s namesake had it right. If, as Thomas Jefferson said, we are all created equal, then why shouldn’t our student body and faculty reflect our nation’s diversity? Why shouldn’t a college education be as available to the poor as it is to the rich, and as hospitable to women as to men? Why shouldn’t students have a say in the way they live and the courses they take? He was on his way out of the chapel when Easter appeared. She gave him a lovely smile and a thumbs-up, but before he could respond, a group of students had cornered him. As she’d done the previous evening, Easter lingered unobtrusively, then picked the right moment to extricate him from the well-wishers. “The president-elect is expected at Sojourner Truth House in ten minutes,” she announced. Instantly, the group bowed to Easter’s claim, and she stepped in to lead Rowan off to his rendezvous with the Black Caucus. As they approached Truth House, Rowan sensed that their conversation, which had seemed like play, had become work. Once inside, she showed him to a seat on the long side of a large oak table, and positioned herself in a chair opposite him that had obviously been held for her. On cue, an intense young man at the head of the table, clad in a traditional dashiki, gaveled the meeting to order. Making a mental note of Bill Stone’s name change, Rowan nodded his assent, but Obea, who had the peremptory manner of one accustomed to being heard, was already forging ahead. “What about black faculty?” someone yelled from the far end of the table. “We proposed that to your predecessor,” Easter interrupted, “and we got no response. Zero.” Rowan was startled by the force of her comment. She pushed back her chair and rose to her feet. Eyes blazing, she spelled out her case in a tone that commanded the attention of the room. When confronted at Columbia, Rowan had tended to get defensive, but Easter’s indignation was passionate and impersonal. Her tone seemed directed at the institution, rather than at him, and he responded with an equanimity that surprised even himself. He took a deep breath, then continued. Over dinner, Rowan learned that Obea had been born and raised in town, and asked him what it had been like growing up in the College’s shadow. “Do college students still work in the public schools?” Rowan recalled his own tutoring in the local elementary school, in a program organized by one of his math professors. “I’ll look into that,” Rowan said, jotting a reminder in a notebook he carried in his breast pocket. He then brought up the subject of the status of women at Jefferson. Easter had plenty to say on this subject, and Obea fell silent. Catching a glum expression on his face and mindful that friction between the civil rights and women’s movements was good for neither, Rowan suggested they call it a night. “What’s your fondest memory of Jefferson?” The timbre of her voice confirmed that they were off duty. They had reached the inn. Easter said nothing, but looked up at him pensively. Then she asked if she could stop by and see him when she visited campus in July. When he reached his room above the square, he went to the window. As Easter crossed the first pool of light, he saw her turn and glance over her shoulder toward the inn. To her colleagues at NYU Sara played down the role, but in truth, being the president’s wife, even in absentia, pleased her. Rowan hoped that her fondness for ceremony might yet find an outlet at gala functions which, several times a year, lit up the President’s House. Soon after he got the job, Sara had called Buildings and Grounds about redecorating the residence. For the first time in his life, Rowan questioned his assumption that to spend money on décor was to waste it. He’d been raised by Depression-era parents and absorbed their deprecating attitude toward appearance and style. His two sports jackets were threadbare, he owned one pair of brown shoes, and Sara had pronounced his trousers baggy. His only criterion for clothing was serviceability, and it had taxed his wife’s patience to badger him into buying a new suit for the interviews at Jefferson. But as the sixties had unfolded, Rowan came to understand that style played a part in political change. The house they were inheriting was dowdy, like the aging couple who’d occupied it since the fifties. He sensed that modernizing its look might, in a small way, help renew the college culture and spirit. On moving day, Sara accompanied Rowan to the campus. When the College driver turned into the driveway of the President’s House, her face lit up. “Oh, my God,” she said, taking Rowan’s arm when they stepped out of the car onto the slate path that led to the front porch. “I tried to tell you,” he said, pleased that she was impressed. Sara darted off to explore the house, and he headed for the kitchen to see what was in the fridge. To his delight, there was a steaming casserole on the counter. “I thought you might want lunch,” a voice said. He turned around and saw a short, round-faced woman in a bright apron. “My name is Margaret,” she said in a strong clear voice. “I’ve cooked for the last two presidents.” Her tone made it clear that she owned the kitchen. “It’s chicken with broccoli. Hope you like it. Shall I set two places in the dining room?” Margaret asked. The breakfast nook looked out on a long sloping backyard. The casserole was as good as it looked, and Rowan was about to serve himself a second helping when Margaret came up to them. A few days later, when Sara left for New York Rowan found himself alone in the mansion except for Margaret’s daily comings and goings, weekly visits by a housekeeper, and a seemingly endless parade of craftsmen following through on Sara’s plans. From day one he began dropping in on people—faculty, deans, dorm counselors, groundskeepers, librarians, janitors, cooks, secretaries, coaches, even the men who stoked the College’s cavernous coal furnace. To his surprise, many of the people he visited wanted to tell him their secrets. All varieties of personal confessions, skeletons in the closet, tips on the stock market—even scandalous gossip—were pressed on him. Every time he agreed to do something, he made an entry in his breast-pocket notebook, and as soon as he got back to the office he set about fulfilling those promises that required his personal involvement, delegating the others. During the interview process, Rowan had met Steve Hobson, a young English professor renowned on campus for his course in modern poetry. Hobson had a burly, athletic build, and his rhetorical skill had won him the respect of his faculty peers. Soon after Rowan had arrived, he’d asked Hobson to gather his colleagues for informal discussions over lunch; Hobson was concerned that, by Thanksgiving, Jefferson’s antiquated policies might trigger more student protests. Toward the end of the first lunch, Rowan brought up his plan to establish a commission to review every aspect of College life. A lively older professor with white hair and mischievous eyes seized the opportunity to give him a quick course in the psychology of leadership. Chairman Knight had urged Rowan to pay a courtesy call on John Rideout, a Washington-based attorney and singularly influential College trustee. He’d made his reputation by defending the foreign service officers Senator McCarthy had targeted during the Red Scare. Mr. Clay’s call for the demolition of Walker Gym gave Rowan all the reason he needed to consult Rideout, and in early August he found himself in Rideout’s sumptuous office, not far from the White House, gazing down at Pennsylvania Avenue. Rideout began by commending Rowan for his “willingness to bear the burden of service,” essentially making it sound as if he were a mere water-carrier, whereas Rowan saw his presidency as an opportunity to make change. Rideout ended his pep talk by asking how he could help. Before Rowan could go any further, Rideout exploded. “Jesus, I warned Jacoby about that. That library is Clay’s monument to himself, and he’d have given the money regardless. I’ll be damned if I’ll see Walker Gym sacrificed to that fool’s vanity.” He paused, reached for a cigar, and passed the humidor to Rowan. As Easter walked into his office, she struck him as prettier than before. He got up from his desk chair and went around to greet her. “I’ll be ready. Would you like some tea?” On a table behind his desk Rowan kept an electric kettle, a teapot, and several large tins of loose black tea. “Oh, lots of things,” Easter replied vaguely. He surmised that she’d come to see Obea. Rowan poured the tea—amber, earthy, and strong—and suggested she drink it like the British, with a little milk. Noting her plans to study in England after graduation, Easter took his advice. “Something’s just come up and I need your help,” Rowan said. Easter nodded attentively and leaned forward, clearly pleased to be asked. “And ready for rebirth,” Rowan finished her sentence. The following evening was hot and humid. Rowan was in the kitchen when the phone rang. “Hi, Easter.” He knew her voice instantly. Easter arrived at about eight o’clock wearing a short red halter dress that revealed smooth mocha-colored shoulders. He showed her through the house to the back terrace that looked down a deep lush yard ringed by lilacs and rhododendrons. When they sat down, Rowan told her he intended to appoint four faculty, four students and several deans to a commission on Jefferson’s future that he would chair himself. “That’s why I mentioned him.” Despite Huey’s show of optimism with the Black Caucus, Rowan knew it would be hard to recruit black professors. There still weren’t that many candidates, and Ivy League universities could offer higher salaries than a college like Jefferson. If Huey Scott couldn’t help him find some black faculty, he didn’t know where else he could turn. “I’ve talked to him and he’s already scouting for us,” Rowan concluded optimistically. Easter’s smile brought him back. “Do you swim?” he asked. Swimming in the College pool made Rowan feel like a student again. He could still perform his old feat of doing two laps underwater, and he was pleased to see relief on Easter’s face when he completed the round trip and surfaced in front of her. Obea did not seem impressed. As if to match his exploit, Easter climbed the diving tower; she stood poised on the board for a moment, concentrating, and he stopped breathing as her svelte body arched through the air in a swan dive. “Good cop, bad cop?” Rowan ignored the question. “Lasting change is the objective,” Easter added, hanging onto the side of the pool with one hand while she treaded water. She climbed out and sat between them. Cool for the first time all day, they sat dangling their legs in the water. Rowan was struck by the contrast between the straggly brown hair clinging to his forehead like a damp mop and the tight black curls that crowned their heads. “Easter and I have been brainstorming how to save the old gym,” Obea offered. After driving them back to Obea’s apartment, Rowan’s mind returned to the image of Easter soaring through the air in her crimson swimsuit. As if to blot it out, he turned on the car radio. “Intense fighting near Da Nang has resulted in heavy American and Vietcong casualties. After evacuation of the wounded, the area was subjected to saturation bombing by a squadron of B-52s.” Rowan followed the war closely, but tonight it seemed almost peripheral. In bed, he had just turned off the light when the phone rang. Rowan closed his eyes. The heat was oppressive, and he threw off the sheet. Although the swim had left him pleasantly fatigued, it was a long time before he fell asleep. Have you been enjoying what you’ve been reading? Read the complete novel on Kindle Barnes & Noble, Kobo and other ebook formats. A print edition can also be ordered from Amazon.